After protesting abuses at the Montana Indian Boarding School, Essie is dismissed from her teaching job there. But before she can depart, she’s kidnapped by Cade Newcastle—the half-breed uncle of her missing student. Shot during the escape and now dogged by a hanging posse, Cade’s desperate search becomes a race against time, and Essie—instead of abandoning him—saves his life. Trading favor for favor, Cade and Essie continue searching for Cade’s nephew. The lines between captor and captive blur into mutual respect, then flare into passion. 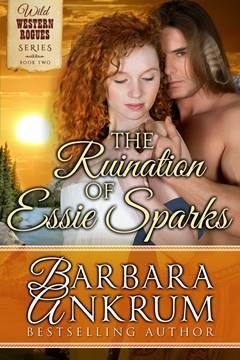 But the hanging posse will never allow the half-breed to be the ruination of Essie Sparks. “They won’t rest,” Cade said with a tip of his head in the direction of the men chasing them. “And I don’t see a doctor anywhere, do you?” He slammed his eyes shut and leaned back against the rocks. She held her hand out. “Give me your knife. I’ll take the bullet out.” For the briefest of moments, those steely gray his flicked up to hers. He seemed to actually consider her offer, whether out of desperation or, more unlikely, hope, she couldn’t tell. She could not read the man, which was probably just as well because she had no desire to understand him. Or, worse, to care about him. Essie snorted and looked away. Of course she wouldn’t have killed him. She was not a murderer, no matter the circumstances. Unlike… possibly, some people she knew. But, heaven help her, the chance to make him pay, in some small measure—with the sharp tip of his knife—for all the torment he’d put her through since the day began wouldn’t break her heart, either. Ugh. That she’d even contemplated such vulgar anticipation shocked her almost as much as finding herself tied to a tree in the middle of the Montana wilderness. It was all his fault. He had brought her to such low imaginings. Ooh! How she hated him! She leaned forward, leveling a look at him that made her feelings plain. “Do you know what I say? I say that you’ll die here from stubbornness. From thinking you can somehow keep me as your hostage when I’m no good to you at all! They could care less about me. It’s you they’re after. Because they won’t let some… some misguided—” She faltered, searching for the proper word. Then, as if he’d made some decision, he slid his deadly-looking knife from the sheath at his hip and pulled himself closer to the tree she was tied to. The blade glinted dangerously in the thin sunlight.